I’m not saying Hawken: Ascension’s patch notes are long, right, but Peter Jackson ordered another month of post-production. I’m not saying there’s a lot of information to swallow, but the NSA are complaining of too much paperwork. I’m not saying that a load of mechs are in a state of flux, but the Transformers have decided to sue. 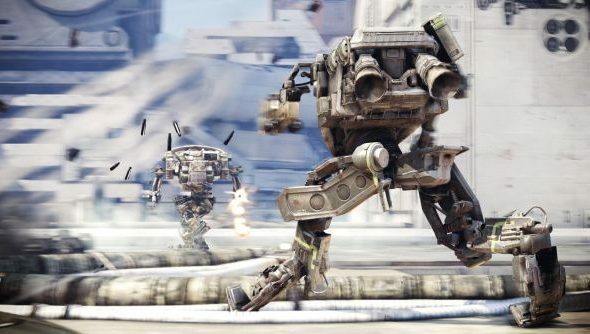 This is the major revamp Hawken producer Jason Hughes told us about last month. “Containing massive updates, changes, and improvements, Hawken: Ascension is a major step forward for us,” said Adhesive Games, chest audibly swelling. “We’ve spent countless hours working on these new features, and we’re confident that you will enjoy what’s in store. Players will immediately notice the far-reaching changes to mech customisation. The old Optimisation system has been replaced by Tuning, and every machine now boasts its own stats. Some are Common – i.e shared by a number of mechs – and others are unique. As your pilot level increases, you’ll gain Tuning points to invest in your metal companion. Similarly, Mech Levels have been replaced by Ranks. Gains in XP will prompt players to increase their machine’s rank for an HC or MC cost, which will see alternate weapons and mechs unlocked over time, as well as ability and Tuning upgrades. Yes, much has changed; so much so that Hawken’s players too must change to keep up. Accounts have been migrated from the last version of the game, and Adhesive recommend finishing a match before checking to see how you’ve been affected. Hawken is still in beta, and while stats and XP will remain intact, all previously acquired internals have disappeared with the new update. In the new Hawken, mechs have access to six Internal Slots; powerful internals will require more than one. You’ll find your old gear has been replaced with an amount of credits equivalent to their total cost. Also missing are bi-monthly test drive mechs – no longer available thanks to changes to the game’s unlock system. Beyond all of that, there are general improvements to matchmaking and performance. Hawken 1.0 is still 0.0.6 update units away, but it looks like the meat of it has appeared today. Bar the little time it needs to mature, this is Hawken as the finished article. What do you make of it?